This page will walk through Spring JDBC example. Spring provides JdbcTemplate for database operations using JDBC. JdbcTemplate is configured using DataSource in JavaConfig or XML configuration. Then we inject JdbcTemplate in our DAO using @Autowire annotation. JdbcTemplate provides methods such as queryForObject(), query(), update() etc to perform database operations. For transaction management we can create DataSourceTransactionManager bean in JavaConfig or XML configuration which is the PlatformTransactionManager implementation for a single JDBC DataSource. To use transaction management, we need to use @Transactional annotation either at class level or method level in our DAO. Spring JDBC provides RowMapper interface that we need to implement to map a database table column names with java class fields. 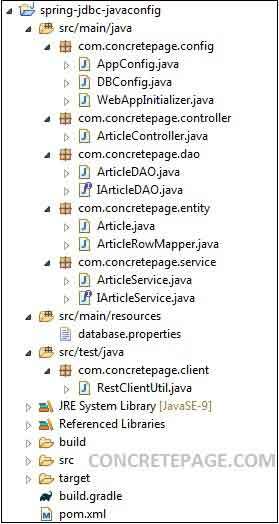 If database table columns and java class fields are same name, then we can directly use Spring JDBC BeanPropertyRowMapper to map a row with java object. Here on this page we will provide a CRUD operation using JdbcTemplate. We will create a Spring REST application that will perform CREATE, READ, UPDATE and DELETE operations using JDBC in MySQL database. Now find the complete example step by step. 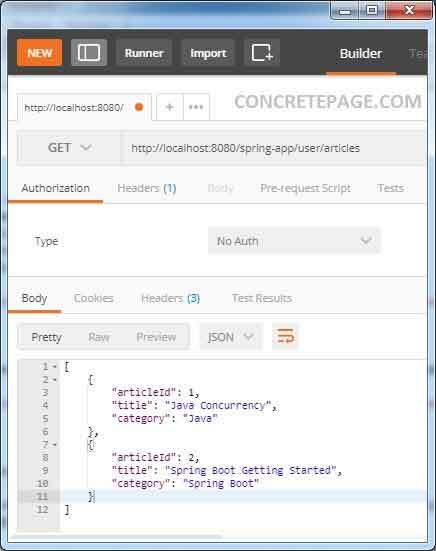 Spring JDBC dependencies can be resolved by using either spring-boot-starter-jdbc or spring-boot-starter-data-jpa spring boot starters. Find the Maven and Gradle dependencies for them. a. Maven dependency for spring-boot-starter-jdbc . Or we can use spring-boot-starter-data-jpa . b. Gradle dependency for spring-boot-starter-jdbc . JdbcTemplate is the central class to handle JDBC operations. This class executes SQL queries or updates. JdbcTemplate simplifies use of JDBC and avoids common errors. To create JdbcTemplate instance, we need to pass DataSource and then we can use JdbcTemplate methods to run SQL queries. We will discuss here JdbcTemplate configuration, RowMapper and running SQL queries. We configure JdbcTemplate in JavaConfig or XML configuration. Find the JavaConfig to configure JdbcTemplate . Find the XML configuration to configure JdbcTemplate . Now in our DAO, we can inject JdbcTemplate using @Autowired. Spring JDBC provides RowMapper interface that is used to map row with a Java object. We need to create our own class implementing RowMapper interface to map row with Java object. Find the sample code to implement RowMapper interface. We can use our ArticleRowMapper with JdbcTemplate as given below. Spring JDBC provides BeanPropertyRowMapper that implements RowMapper. We can directly use it in place of custom RowMapper. We use BeanPropertyRowMapper in the scenario when database table column names and our class fields name are of same. Then we can change above code as following. JdbcTemplate provides methods to run DML and DDL SQL queries. Find the example of some of them. This method fetches data for a given SQL query as an object using RowMapper. SQL query can have bind parameters. Find the description of parameters. sql: SQL containing bind parameter. rowMapper: Object of RowMapper implemented class. RowMapper will map one object per row. args: Arguments that bind to the query. This method executes static query and maps rows to Java objects using RowMapper. Find the description of parameters. sql: SQL query to execute. This method executes insert, update and delete statements. Find the description of parameters. Now we will perform CREATE, READ, UPDATE and DELETE (CRUD) operation. 1. CREATE: Find sample code snippet for CREATE operation. 2. READ: Find sample code snippet for READ operation. The above method will return a list of objects. If we want to fetch a single object, we can write READ operation code as follows. 3. UPDATE : Find sample code snippet for UPDATE operation. 4. DELETE : Find sample code snippet for DELETE operation. For transaction management we will use DataSourceTransactionManager. We will create a bean of it. Find the code snippet using JavaConfig. Find the code snippet using XML configuration. DataSourceTransactionManager is the PlatformTransactionManager implementation for single JDBC DataSource. DataSourceTransactionManager works with any JDBC driver as long as connection factory mechanism uses javax.sql.DataSource. For transaction management in our DAO, we need to use Spring @Transactional annotation at class level or method level in which we use JdbcTemplate to run SQL queries. Spring @Transactional is used at class level as following. When we use @Transactional at class level, all methods of the class will become transactional. If we want to make selected methods transactional, we need to use @Transactional at method level as following. Find the project structure with JavaConfig in Eclipse. Find the MySQL table used in our example. Now find the complete example. Find the project structure with XML configuration in Eclipse. Here we will provide only XML files. Other files will be same as given in project using JavaConfig. To build and run the demo application, follow the steps. 1. Create table in MySQL database given above on this page. 2. Download the source code from the link given below on this page. 3. Go to the root directory of the project using command prompt. 4. Build the project using gradle with following command. We can find WAR file in the build\libs directory. If we want to build the project using maven, use following command. We can find WAR file in the target directory. 5. Deploy the WAR file using tomcat. 6. To test the application, use RestClientUtil.java file given in the demo project. We can also test application using Postman. To get all articles, we need to run following URL.